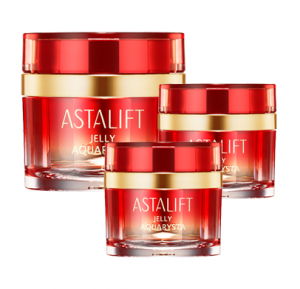 The epitome of all ASTALIFT’s products – Jelly Aquarysta, is a unique anti-ageing phenomenon for every woman. The uniquely named Aquarysta is derived from AQUA and CRYSTAL, which symbolises the light as water texture of the clear jelly, and the crystal-clear, moisturised skin it brings.It is the first product to be used right after cleansing / washing in your daily skincare regime, and before lotion and emulsion. This extraordinary revolutionary skincare formula targets visible signs of premature ageing: dark spots, lines and dull skin, delivering visibly younger, more luminous and ‘replumped’ skin.